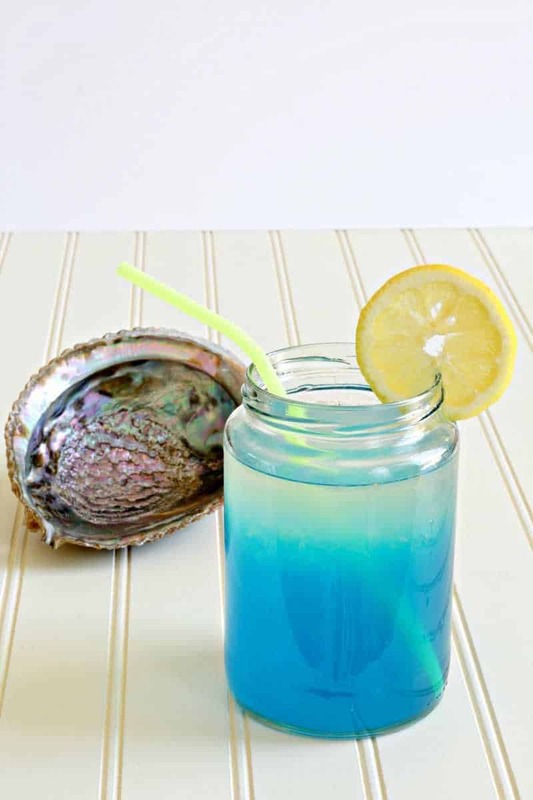 Non-Alcoholic Mermaid Lemonade Changes Color From Yellow to Blue! Summer is a great time for pools, cool drinks, and mermaids! I combined all of these ideas into this cool, color changing, non-alcoholic mermaid lemonade — perfect for sipping on poolside while you rest your weary fins! This mermaid lemonade would be a great addition to any mermaid party — or just for anyone who just wants to pretend they are a mermaid for a while! When I was a little girl, my ultimate career goal was to be a mermaid. I was hooked on The Little Mermaid, I crocheted myself a mermaid tail (before it was cool), and practiced holding my breath underwater. Alas, as I grew up I found that being a mermaid was not a viable career option. But I still haven’t given up the dream! I told my husband to forget about jewelry on our 10th anniversary; all I want is one of those fancy schmancy silicone mermaid tails! Until I get my tail, this mermaid lemonade is the next best thing! 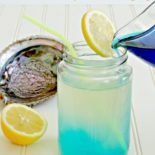 This mermaid lemonade changes colors! By harnessing the power of density (science FTW) I was able to create an ombré effect in stunning blues and yellows, with just a hint of green in between. If you want to make this with your child, you can make it a fun lesson in density! Science + mermaids = drink full of win/awesome! Here is what the lemonade looks like before the magic happens. As I mentioned before, the secret is density. 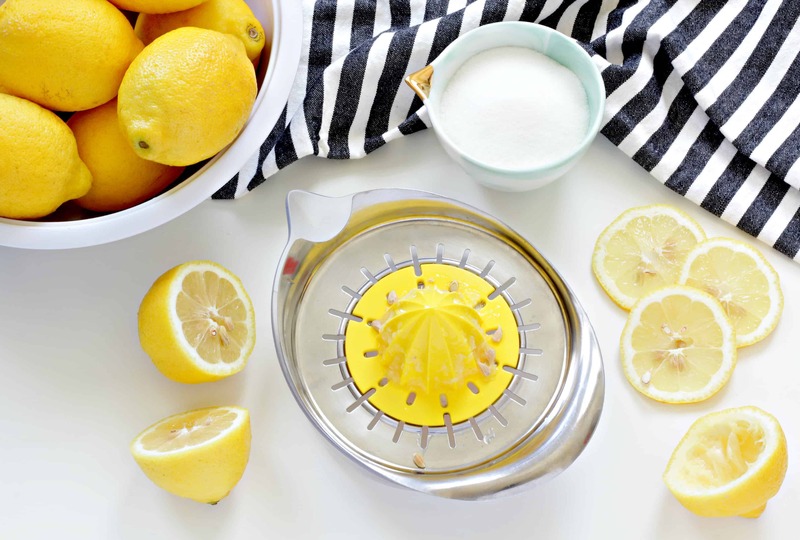 You first create a slightly more-sour-than-normal lemonade. Next, you mix a heavy simple syrup in a dark blue that is much denser than the lemonade. Then, when you add the syrup slowly to the lemonade, the blue simple syrup will sink to the bottom and the yellow lemonade floats to the top! 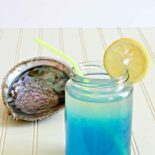 Mermaid lemonade is really simple to make, no fancy ingredients required. First, create the simple syrup. Bring one cup of water to a boil and add the sugar, stirring constantly until the sugar is completely dissolved in the water. 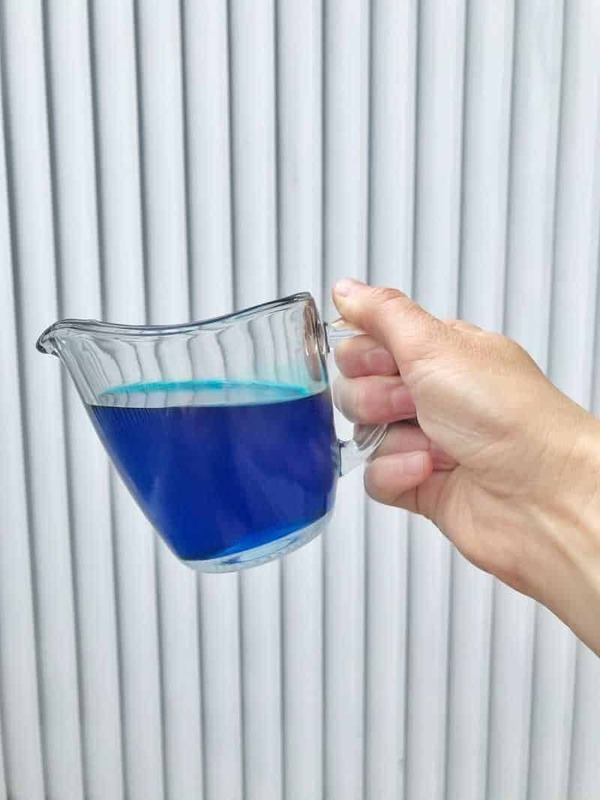 Add the food coloring as desired to make the syrup blue (I went pretty dark because once it mixes with the lemonade it lightens up considerably). Stir until the food coloring is completely mixed in the syrup. Cool completely (I put mine in the fridge to cool down once it was no longer burning hot). Bring 2 cups of water to boil and add 1 cup of sugar, stirring constantly until it is dissolved. Cool completely (I put this in the fridge to cool as well). Place 5 cups of cold water in the lemonade dispenser. Juice all of the (9) lemons; remove seeds and pulp if desired, and add all the juice to the water in the lemonade dispenser. Once the 2 cups water + 1 cup of sugar is cooled completely, add it into the water-lemon mixture. Stir to combine all and place back in the fridge. When both the lemonade and the blue simple syrup have cooled completely you can begin to mix the individual cups. 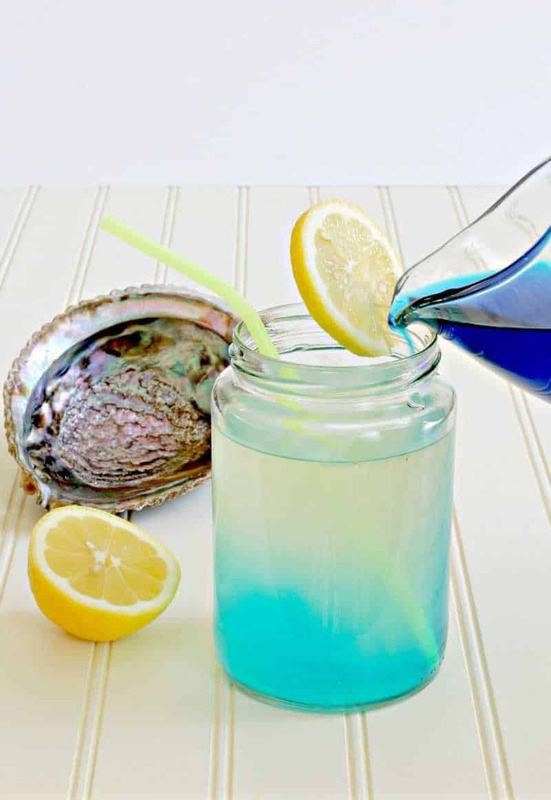 Admire the pretty colors and stir when you are ready to drink; the sour lemonade will combine with the sweet blue syrup to create the perfect flavor! Mmmmm, tastes better than the ocean! Final step: make like a mermaid and sip this blue concoction poolside! 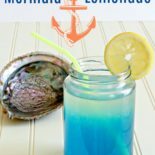 I hope that you like this recipe for mermaid lemonade! This color changing non-alcoholic mermaid lemonade is perfect for pool parties or children who love mermaids! Sip it poolside while you rest your fins! Bring one cup of water to a boil and add the one cup of sugar, stirring constantly until the sugar is completely dissolved in the water. Add the food coloring as desired to make the syrup blue. Bring 2 cups of water to boil and add 1 cup of sugar, stirring constantly until it is dissolved. Cool completely. Place 5 cups of cold water and the juiced lemons in the lemonade dispenser. Once the 2 cups water + 1 cup of sugar is cooled completely, add it into the water-lemon mixture. Stir to combine all and place back in the fridge. Such a neat recipe Marissa. Might have to use this with my preschool class on science Thursday. Oh, it would be perfect for a science class! That is so exciting, let me know how it goes! You guys could also make the ocean sensory bottles with oil and blue water too…so many ideas! I am so gonna make this for my daughter’s beach bday party! I’m going to have to see if this will work with iced tea since we drink A LOT of it during the summer. Wonder what color to make the simple syrup? Love this, Marissa! Such a neat mix of science and deliciousness! Pinned! This lemonade looks so refreshing and fun! I know that the grand kids would love making it. Thank you for sharing at This is How We Roll Link Party. Incredibly cool! I have to admit, I love the little mermaid, but I have never urned to be a merman. LOL this drink will do it for me! This is the coolest!! What a fun summer drink. My kids would love it. Pinning! 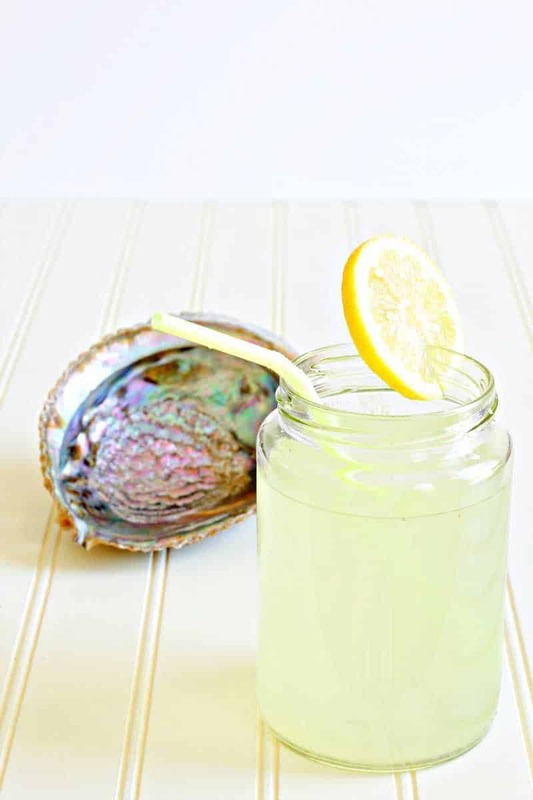 Your Mermaid Lemonade will be so refreshing for our hot summer days! Thanks so much for sharing with us at Full Plate Thursday and sure hope you have a great week! Very cool beverage idea. I have an 8 year old granddaughter who is all about science lately. This is perfect for her, she will get such a kick out of it. Pinning. I’m coming over from the Grandma’s House link party & i have to say, this looks so refreshing! The ombré effect is so awesome! I’m looking forward to following along with your blog!